Boat and Barge on the Caribbean coast of Costa Rica in Puerto Viejo. 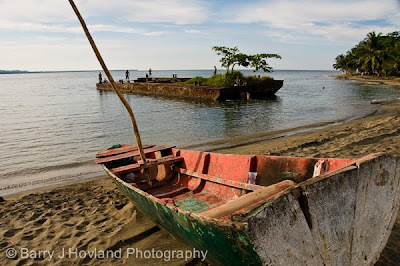 This barge is a permanent structure on the black sand beach in Puerto Viejo de Talamanca Costa Rica. On a summer Sunday afternoon is the best time to catch kids jumping off and hiding underneath the barge. Their laughs are infectious and even a bit spooky as you sit on the beach and hear the echoed laughter of unseen children. We highly recommend traveling to the Caribbean beaches of Costa Rica. It’s good, it’s cheap and it’s inspiring for a photographer. As if we needed reason to come! !… OK, well, now we're beckoned even more! What a great image, and I really really enjoyed the accompanying blog post as well!